Do you prefer traveling light or do you carry the world with you? For all types of travelers, Unigear Dry Bag is a must-have. The waterproof dry gear sack is an ideal survival product for extreme water sports and adventure enthusiasts. If you were carrying electronic gadgets, like camera, tripod, lenses, or sleeping bags, and winter-wear, surely you would want them to remain dry and away from dust or dirt. You might need the high grade Unigear Dry Bag, which I used on the last few trips to the wilderness, and I must say, as a traveler, I am pleased with this easy to use, dry bag. The Unigear Dry Bag is a one of a kind, lightweight, easy to use, waterproof, and durable for long journeys. Those travelers, who would have to carry a lot of electronics, would definitely need this dry bag for future trips. To make the bag waterproof just roll over the top for three to four times and buckle the top. This will be enough to keep the water away and this will help the contents of the bag safe from moisture and dust. The waterproof guarantee that Unigear Dry bags promise to you all is something that you should know. 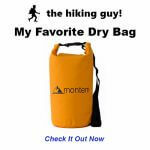 Lets check out some of the features for this dry bag below! Lightweight and Durable: If you are going to tour for a month, or more, traverse across extreme cold temperature zones, then all the layers of clothing, and survival kits and medicines become essentials. Carrying all of those would be an issue and dragging the luggage, on trolleys become a pain, especially if you are going across mountains and valleys. The Unigear Dry bag is ideal for you if you do not think twice before jumping ahead in to a canoe, or go rafting in the winding rivers, or even go rapelling. Such bold and dashing travelers might still be able to experience all of these with the light weight dry bags. Tough material:The vinyl material is strong and is water-resistant, in short, just right for your next fishing expedition with friends. Feel free to carry dry materials and electronics even as you go on a snowboarding trip or a vacation to the beach side. The bag shall face all types of rough weather for you. From sand, and dust, to rain, hail, and snowfall, you name it, and the contents are safe! 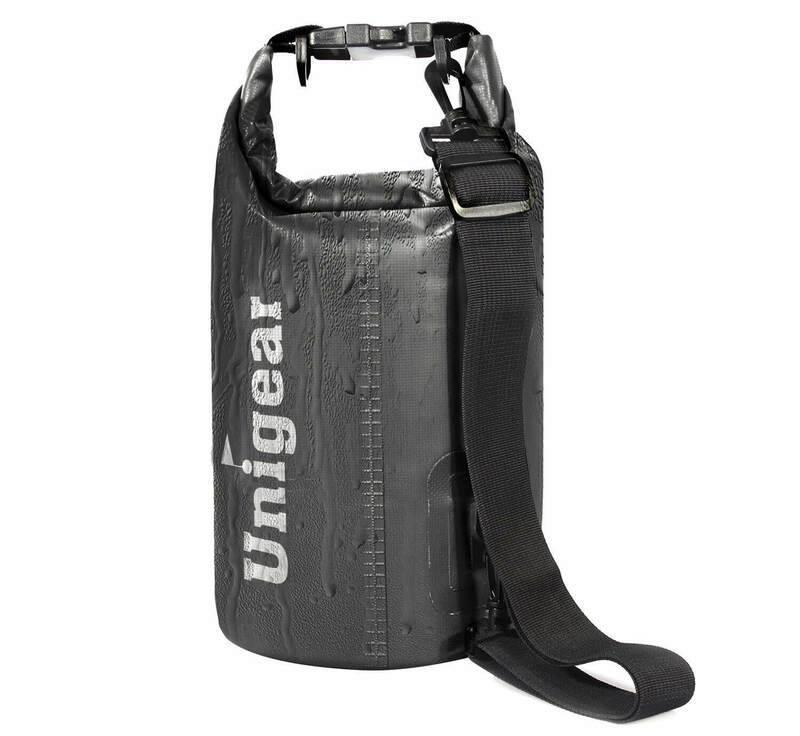 Sizes: Unigear Dry Bags come in the following sizes - 5L, 10L, 20L, 30L, and 40L. This means that depending on the quantity of things you might wish to carry for the next trip buy the one for yourself. This roll over top of the bag is very easy to handle and the round bottom dry bag also has adjustable straps to sling across as you kick-start your adventure. Phone bag: One striking aspect about this Unigear Dry Bag is that it comes with an additional phone bag, which shall easily accommodate a smart phone. This also comes with waterproof film or plastic film that shall keep sand, dust, water and every other pollutant away from your smartphone. Affordability and durability go hand in hand: This is true that people shall find these bags durable and affordable and only then they shall go for it. Unigear therefore, offers this dry bag at affordable price. The round bottom of the dry bag is of good quality of vinyl and this is going to hold most of your personal belongings. Trekking﻿﻿ or scuba diving is now going to be easy and you need not even worry about the belongings becoming wet or damp anymore. Ease of Maintenance: The dry bag is going to be of great help for you for every trip that you take in the future. Whether you are going camping for a day or for a weekend trip to the beach, just pack in everything in these dry bags. On your return, just wash the bag and dry it. The bag is ready for its next voyage! With over 680 customer reviews, this dry bag from Unigear enjoys a rating of 4.6/5 stars on Amazon.com, making it one of the bestselling models. Customers are all in praise of this product mainly due to its incredible durability and a wide range of colors that caters to their tastes. This product also comes in a diverse variety of prices according to the size of the bag. Even though the high capacity models may get slightly expensive in comparison, you shouldn’t fret before buying this product because it is worth it. Those who seek a reliable dry bag that is free of complications, you’re taking a look at the right product. To conclude, we give a thumbs up for this beautiful Unigear Dry bag, which has become a benchmark product from this brand. The bag is available in bright colors and size options for you to pick the one you like most. So, go ahead and choose one that takes your fancy and you’ll have the best travel partner for life- Unigear Dry Bag!